The latest development in the creation of the revived Islamic Caliphate comes out of China. On 4 July 2014, ISISleader Abu Bakr al-Baghdadi effectively declared war on China by publishing a map of its aspirant caliphate that threatened to occupy China’s Xinjiang, and named China first in a list of 20 countries that had “seized Muslim rights.” China’s Uighur Muslim population is known predominantly in the western regions of the country, which is often marginalized by the officially atheist Chinese government. Yin Gang, a West Asian and African Studies scholar at the Chinese Academy of Social Sciences, reported in a western news media, that hundreds of Chinese nationals are currently fighting for the Islamic State, citing previous examples of Chinese citizens joining al-Qaeda in Afghanistan. It is becoming apparent that Uighurseparatists are joining ISIS in the Middle East. I think this was a very dumb move for ISIS. However, I think it will be entertaining to see how China responds to this "threat." They will either put "boots on the ground" or they will blow it off as if it matters very little to them. This is something I will have to keep an eye on. China doesn't tolerate anyone interfering in how they run the country, so I am all for them to use all their might to oust ISIS and destroy them. They are ruthless enough to do it and don't care about any Human Right violations and they have the manpower and weapons. I see it the same way. I don't think many countries will intervene if China decides they are going to put an end to ISIS and their delusions. I would love to see China obliterate ISIS. It will save the United States some trouble from having to send troops. These guys need to be taking out as soon as possible. I say yes to this. And there are billions of them who are way too adamant for such conversion and taking over. I don't see ISIS being powerful in this country at all. It is going to be an interesting picture to see how China would take down ISIS. This is something the world and the US could learn from them. They are not push overs on this subject. I think that they are not known for being smart, the are just extremist, they don't fear death and their actions prove it. 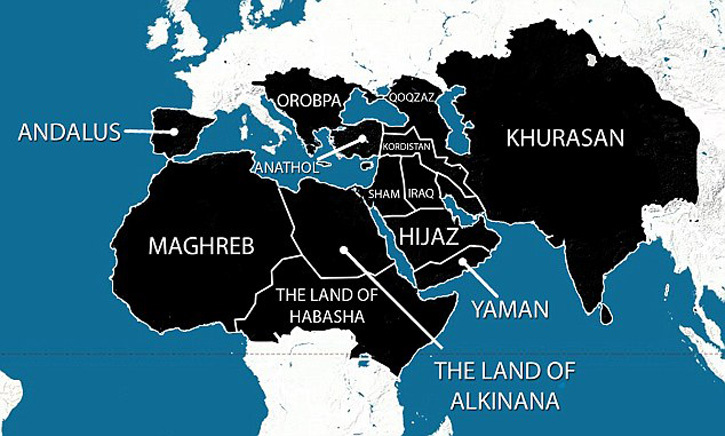 Scary to see that my country appear in black in that map, I just hope they keep away. I hope that they keep away for your sake, as well. I guess you are right when it comes to them not being know for being smart. I think they have only gotten as far as they have because they took the world by surprise. It's like that black squirrel that runs into the house under your feet and causes havoc in your house while you are trying to swat it out with a broom. Eventually, you shoo it out the door, but it leaves a mess to clean up. I won't say "Serves you right, China!" but this situation is a challenge for the "sleeping giant." Since its foray into the bigger markets, China couldn't stop boasting about its "power." I guess this is the perfect time to show off their military prowess and join the fight to eradicate ISIS and put an end to their murderous Islamic ideology (I doubt they're actually following the real Islamic teachings). Like Weepforsweep said, hopefully China can whoop ISIS so that the U.S doesn't have to worry about them any longer. This is the break we need, and would be a weight lifted off our shoulders. After the ISIS terrorist attack in Australia, I feared that ISIS would be targeting weaker countries, but I'm glad this is not the case. I don't think China will have any problems in wiping ISIS off the map, so to say, if China were to put boots on the ground. However, I don't see China doing that any time soon. When was the last time China sent troops to fight in other peoples' wars. Yes, the unrest in certain parts of China are related to the way the Chinese government had been treating the Muslims there, but, as far as I know, China considers that an internal affair and they will deal with it in their own way. They might as well declare war on the moon. A ragtag band of terrorists might be able to claim a significant amount of territory and victories in a civil war-ravaged, destabilized region with crippled infrastructure amidst countless other militant outfits vying for power. But invading even a small nation state with a trained and disciplined standing army and comparatively enormous resources and military technology is entirely different. But proposing to fight both India and China on two fronts? That is nothing short of sheer and utter insanity. I agree. I really doubt China is going to put up with this. Knowing China they'll find a way to deal with it, and hopefully it won't blow up in their faces. Hopefully nothing goes wrong. And I definitely agree with those above me with their comments saying that I definitely hope that China just takes care of ISIS and stops them for good now, so that the United States doesn't have to get any more involved with this matter and we don't have to deal with it anymore in our country! Thanks and yes, that's pretty much it, the world didn't saw them as a menace because they were making war away from us, but now they kill our citizens and they menace our countries so they deserve to be treated like a real menace. I didn't know China was an officially atheist nation. Why would ISIS want to battle China? China has way to many people and resources, that's a losing battle. I do believe that some people in China are upset with some of the actions of the government, but it's a difficult task to tear the system down.